Welcome to Stripes Gamer the only website to visit for eSports games and tournament information. 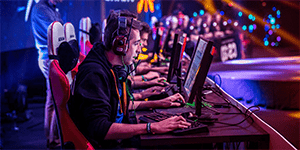 We have everything you could possibly need including a list of eSports games like League of Legends (LoL), as well as everything you need to know about the top eSports teams, the players to follow and bet on, and when the next tournament will be played. If games online are something you are interested in, Stripes Gamer has you covered. eSports which can also be referred to as egaming is the umbrella term for competitive video gaming. The term eSports covers both online gameplay as well as the viewing of online tournaments. It is essentially professional video gaming and it has been increasing in popularity over the past number of years. There are teenagers who are now earning millions and signing sponsorship deals, for doing what they love to do. If you are just getting started with games online it can be confusing. There are so many games, players, and teams, that it can be difficult to know where to start. That is where we come in. We've gathered everything you need to know and compiled it here on the page of our website. There isn't a definitive list of games when it comes to eSports because more and more are being added all the time. What we do have though is information on the most popular titles, the tournament games, and the ones that stand out. Below is a list of the three most popular games online and a little bit of info on each. You will find the full details on our eSports Games List page. League of Legends (LoL): This is one of the most popular titles and there are plenty of tournaments to watch and take part in. There are over 27 million people playing this game daily and it remains one of the most popular eSports games in the world. Counter Strike: This game has been around since 1999 and the sequel Counter-Strike: Global Offensive (CS:GO), which launched in 2012 had paid out over $4 million in 615 tournaments by 2015. Dota 2: This is another popular gamers choice. The International 2014 Dota 2 tournament had a prize pool of over $10 million and most of the highest earning eSports players play this game. 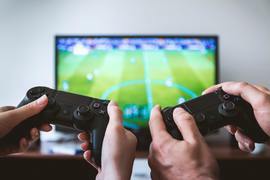 Other eSports games online that players can enjoy and compete in tournaments include Call of Duty, StarCraft 2, Guitar Hero, Uncharted 4, Fifa, World of Warcraft, and halo. You can find more information on tournaments by visiting our guitar hero tournament and uncharted 4 tournament pages. Fnatic having earned $2,963,541 in 51 tournaments playing a range of games including Battlefield 4, Dota 2, and Counter Strike: Global Offensive. SK Telecom T1 having earned $2,721,216 in 26 tournaments playing League of Legends and Starcraft. You can find out more about the different eSports teams, their players and the prospects available to them here on our website including exactly how much money you can earn as a professional gamer. The most famous eSports pro players include Soren B (Bjergssen), Henrik H (Froggen), Zaqueri B (Aphromoo), Danil I (Dendi), and Jason T (WildTurtle). MLG is well known to pro gamers in the US. There is also Electronic Sports League (ESL), and Twitch is the video platform where eSports games can be broadcast. Game publisher Valve runs The International tournament which is devoted to Dota 2. Blizzard also runs its own tournaments for Starcraft at BlizzCon. Funded competitions are the backbone of the eSports industry and what had made it become a billion dollar industry. There are a number of big tournaments. The International has a total prize pool of $10,931,100 in 2014 which outweighed a host of sporting tournaments including the Super Bowl. The International tournaments have been running since 2011. Next in line is the MLG Pro Circuit and then Riot's League of Legends World Championship. You can find out more information in the tournaments section of our website. Twitch is a dedicated gaming content channel with more than 11 million broadcasts each month. Here you can watch tournaments and many pro players stream on the service during downtime too. Other sites include Azubu, ESPN2, and you will find some eSports content on YouTube as well. For a live experience you can check out an eSports stadium. There are stadiums in South Korea and there is also a stadium in the UK. You don't have to stop at just watching eSports tournaments and eSports games. You can now enjoy eSports betting. Unikrn is a portal that you can use for betting on eSports tournaments and there are plenty of other online eSports gambling sites too. You can find out all you need to know about making money with eSports on our eSports betting page.